Dating to the 1600s, these "typical" dungeon shackles are locked by a bracket that holds them closed and a chain that is run through the jaw in front of the bracket, thus preventing it's removal. With a padlock at one end and a "end piece" at the other, the chain cannot be removed from the shackles, and thus they cannot be removed. They are rather chunky and heavy,leather wrapped to soften the edges, and quite snug fitting. 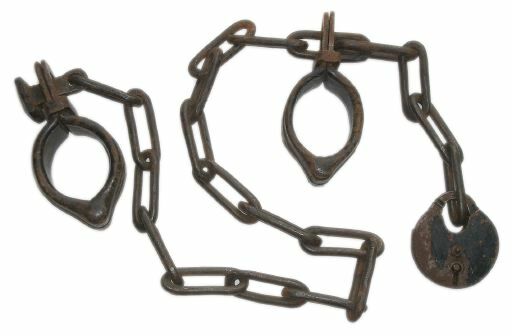 Another variation on these can be seen in 17th Century German Leg Irons and Padlock.